Studio visit with Holly Harrison (left) and Abigail Ogilvy (right). Concord, MA. Holly Harrison’s newest mixed-media works are now on view at Abigail Ogilvy Gallery in Collected Stories, a duo exhibition with Kristina McComb. Prior to the opening, we sat down with Holly to ask her a few specific questions about her new Color Field series. Abigail Ogilvy: In your artist statement, you discuss the collage elements, but don't explain how or when you decide to put them into the work. Why do you choose certain collage elements? Holly Harrison: This is an interesting question. There are probably a few different things happening. I think a lot about how much paper garbage there is in the world and all the postcards, flyers, junk mail, etc. that come into the house. So many resources go into creating this “stuff”, and I mostly just throw it into the recycling bin without looking at it. I decided to bring some of it into my studio practice by incorporating it into the painted/altered collage surfaces I’ve been creating. Collage Detail: Flash, Holly Harrison, Mixed media and found papers on wood panel, 30 x 30 in. Along with meaningless paper junk, there’s also a lot of meaningful paper around. My daughter’s old drawings that I can’t bear to throw out (even though I have SO many of them), postcards from art shows, maps from places I’ve been, beautiful printed papers I’ve collected or that people have given me, vintage books and some old comic books (Jim and Mira both love old comic books and sometimes damaged or “not valuable” ones make their way into my collage stash), that sort of thing. And then there are random paper scraps that seem to proliferate everywhere, especially in my purse and on the dining room table—shopping or to do lists, Mira’s homework (lots of math equations), my husband’s notes for his gym workouts, etc. The other day I found a piece of paper on which I had written “retro futurism”. Why did I do that? I can’t even remember. I’m drawn to these random scraps and decided they would be interesting in the mix of papers I’m using. Because I’m washing most of the collage elements with white paint (sometimes other colors), I can use pretty much anything since it’s just there as a hint. The paint unifies everything, making it possible to join together lots of random things. It’s like a pool of memories–some things are more visible, others are pretty deeply hidden. I’ve always been curious about how memory works. Your brain can hold so many things; it’s interesting to me that along with remembering important or moving experiences, our brains also hold onto random, even meaningless things. When I’m composing the white collage fields, I’m working pretty intuitively. Generally I’m choosing from painted papers that I have previously created, so I’m just thinking about what looks interesting and finding relationships between the elements. Sometimes the layouts sort of present themselves to me and other times it takes a long while for me to get everything to a place where it feels like it’s working. I try not to have an agenda when I’m moving the papers around and instead am responding to the materials and to the hints of narratives that start to come together. AO: This new series moves away from imagery. In your artist statement you ask, "How do you create meaning when you are not working with images? " What made you interested in this topic? What caused this transition? Studio visit in Concord, MA. Three, Process, and Flash, now on view in the Collected Stories exhibition. HH: I wanted to stretch myself. I had been working with bird imagery for a lot of years, and I wanted to do something different. When I’ve been working in a certain vein for a while, I can get into habits: I’ll know that certain colors will look good together or adding a particular collage element will be visually successful. But I feel kind of lazy when that happens, like I’m relying on easy solutions. Maybe it’s because I got a late start as a visual artist, but I don’t want to be complacent, I always want to be learning and moving things forward or going deeper. I tried out a few different things and have some ideas on the back burner, but there wasn’t a subject per se that felt as compelling to me as the birds had. But I did find that I was really interested in the idea of structure and how it relates to meaning, which is something that comes out of my background in poetry. Even though I’m not a conceptual artist (at least not yet), I enjoy the thinking that goes into creating a piece or a new body of work. Setting aside image allowed me to focus on the conceptual part of making a painting. And thinking more deeply about how I build a composition led me to questions of meaning and abstraction. Even though finding my way into the process took a long time, I feel the work that I am making now is both an extension of previous bodies of work (it’s still recognizable as mine) and also references poetic structure and process. AO: In terms of the color fields, did you ultimately decide they are empty, or are they full? You ask the question, but then how do you ultimately feel it impacts the work? HH: To me, this body of work is more about asking questions than it is about answering them. I hope (maybe even am counting on) that the viewer will have their own thoughts and questions as they engage with the work. In my earlier paintings, I liked using visual elements that could be read as multiple things—a long horizontal line with tabs of vertical collage might read as a fence, a zipper, birds on a wire, etc. The brain likes to find meaning even where there is no one intended meaning. This is similar to how poets use language, where meaning is relative and the role of the reader is to interpret and interact with what is there. So that’s something I’m aware of when I’m working, and it’s something I like to play with, this idea that meaning can and will change, depending on what the viewer is bringing to a piece. View Holly Harrison’s artwork at Abigail Ogilvy Gallery through February 17, 2019! Detail of Process, 2018. Mixed Media and found papers on wood panel. 36 x 12”. 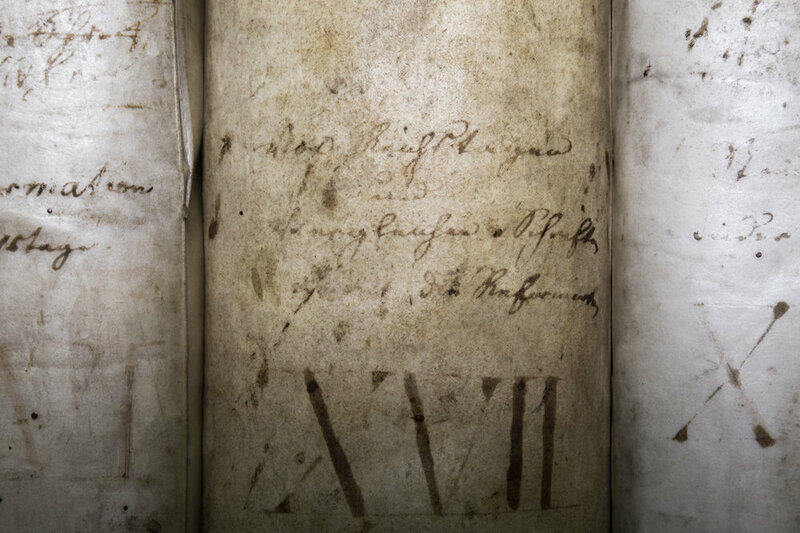 Kristina McComb’s newest series, An Archive of Time: A Life Lived in the Boston Athenæum documents the books in the library, worn and weathered through age and use. Focused on books whose individuality catch her attention, McComb creates images that highlight the unique history they have endured. These striking photographs bring attention to the tears, folds, broken spines, and cobwebs that mottle their surface, and celebrating their imperfections rather than shunning them. She explains, “These are the details that tell me the story of the work and share a history of who has touched and been influenced by this book.” Each image conveys a sense that the artist has a genuine admiration for the subject of her photographs, thereby imbuing each image with vitality. In a way, her images give the books new life while providing a platform to tell their stories. Last year McComb entered the Boston Athenæum as an artist in residence with only a vaguely formed plan, instead relying on the books to provide inspiration. This discovery plays a large role in her process. In fact, she deliberately does not interfere with how the books are positioned-- only documenting exactly as she finds them, the unedited truth of how they exist in the library. Additionally, she does not edit as she shoots, but lets the images that speak the loudest to her be chosen for the final prints. Her photographs are artfully composed with careful consideration of light and angle. The project will culminate in three volumes of bound books, each consisting of fifty images. The photo books will include a short essay by a research library from W. Van Alan Clark Jr. Library, the essay is based on institutional ghosts that haunt libraries and their impact on the current state of libraries. McComb not only wants to preserve the history of the books, but the project also honors the walls of the library itself. 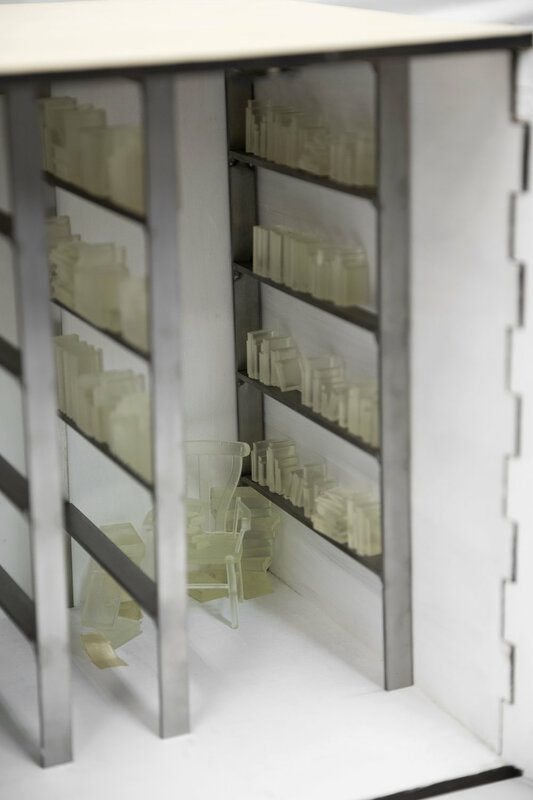 In addition to the books, she has created a laser cut wooden miniature library to house these books that pulls direct influence from the architectural design of the library. They will contain steel bookshelves with 3D printed miniature books arranged on the shelves and LED lights imitating the feel of the library’s interior. There will be 15 editions available of this version of the project. Ultimately, McComb’s goal is to archive the books as they are now. By freezing the books in their current state and giving them a new life through digital reproduction, she starts the cycle anew, letting the images age much like the books themselves have aged. Individual images from the project will be on view at Abigail Ogilvy Gallery from December 20, 2018 - February 17, 2019. Q: At Abigail Ogilvy Gallery, you present both group and solo shows. Is the creative process for curating solo shows particularly different than for a group exhibition? Abigail: Absolutely, each show is so nuanced in terms of how it comes together. Our recent solo exhibition with Anna Schuleit Haber happened very organically, the works were all in the Northeast (her studio is in New Orleans) and she was quick to work with us on the writing and promotion. For our current show, Night Swimming, Ally and I both researched, met with artists, and discussed who would be the best fit. We were excited to exhibit a few new artists this summer, and are very pleased with how the show turned out. Q: How long did it take to plan this exhibition? How far in advance did you start preparing for Night Swimming? Abigail: Each exhibition varies, but for this particular exhibition it took just over a year of planning, studio visits, and selection of the artwork. Q: How did you come up with the title, Night Swimming? Abigail: Ally picked it! So I’ll let her explain. Ally: I felt Jenna Pirello's piece Night Swimming encapsulated elements of other artists work, visually it references the black background of Donna Moylan's work Twelve Twelve, as well as the fluidity of Natalia Wróbel's work. Austin Eddy also reference's swimming and nighttime in a few of his titles such as, Four Birds, Two Boys, Lake Floating Late at Night in Spring and Two Birds, One Flag Bearer Swimming Down Stream Past a Tunnel. Q: You are showing Austin Eddy’s artwork for the first time, what drew you to his work initially? Austin Eddy, "Flying-Fingers, City-Face (Between Here and There)," Oil stick, paper collage on fabric collage on canvas, 40 x 60 in. Abigail: I saw Austin’s work in an exhibition in June 2017. We were attracted to his work for the same reason we exhibited each painter in this show. Like all of the artists on view, Austin has a unique and interesting process, is hardworking, smart, and an incredibly talented artist. For Austin specifically, I was initially attracted to his use of basic geometric forms as building blocks for his paintings. Ally: Abigail showed me his work and I loved his use of texture. Q: Austin Eddy, Donna Moylan, and Jenna Pirello are originally from the Boston area, and Natalia Wróbel worked in Boston until last year. Did this impact your decision to feature them together in this exhibition? Abigail: Isn’t it interesting how they all have ties to Boston? That was a complete accident, we actually didn’t even notice until we were finalizing their bio pages on the website! Q: You represent Natalia Wróbel, and have featured her paintings in previous exhibitions at Abigail Ogilvy Gallery. How did you decide which of her works to include in Night Swimming? Natalia Wróbel, "Luminaries," Oil paint on linen, 39.4 x 47.2 in. Abigail: Natalia is constantly pushing herself to create new work and go outside of her comfort zone artistically. When she does so, a new series is born and it is amazing to watch her work grow and develop. This new work was created during her artist residency at the Berlin Art Institute in Germany this past fall, and this show debuts these works in Boston. Q: The paintings featured in Night Swimming explore the imaginary using both figuration and abstraction. What effect do you think this has on the audience? Abigail: Our goal is always to create interesting exhibitions in which visitors want to spend a lot of time with each artwork. The works in Night Swimming really cannot be understood with a quick glance, the audience is forced to slow down. It’s been wonderful to watch our visitors take in the work from a distance, and then get close and analyze the details. Ally: I hope it inspires our audience to ask questions, whether to themselves, their friends, or to me! Q: What does a typical installation day look like for you? Abigail: I absolutely love install week! Well, it is really a two day period. It may come as a surprise, but I am typically the person who de-installs the previous show (taking down the works), and then I retouch the walls with spackle and bright white paint. When the walls are blank and ready for the next show, there is so much opportunity on the horizon! Usually de-install takes a day and then we install the next day, we like efficiency. Ally: And a couple trips back and forth between the gallery and Home Depot! Q: What would you say is the hardest part of coordinating an exhibition? Abigail: Ah, I hate that question! To answer the reverse of that question, my favorite part is when the first artwork is hung and we are on our way to having a show! Ally: It's hard to pinpoint, each exhibition presents its own set of unique challenges which is part of what I love. Q: Any upcoming shows you are excited about? Abigail: I think our programming in 2018 has been our strongest in the gallery history – and we have a powerhouse roster of artists exhibiting this fall. Starting with Rena Detrixhe’s installation of Red Dirt Rug in September and ending with our first solo exhibition by Natalia Wróbel in November! Ally: All of them - go check out our upcoming exhibition page to take a peek what's next.